Every year in Illinois, hundreds of thousands of people go to court without the help of an attorney. Nearly two-thirds of defendants are unrepresented, and for some types of cases, that number exceeds ninety percent. While some are “DIY litigants” who prefer to go it alone, the vast majority would rather have an attorney—they simply can’t find or can’t afford one. Limited scope representation is designed specifically for these situations, allowing attorneys to focus their expertise on discrete issues and actions, while the clients handle the other parts of the case independently. 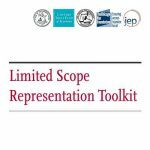 The tools and resources below can help you incorporate limited scope representation into your practice and connect with prospective clients. 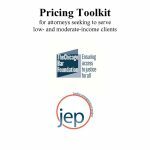 The CBF and Justice Entrepreneurs Project (JEP) Pricing Toolkit provides practical guidance for lawyers on pricing legal services to be more affordable and accessible for regular people.